April 23, 2015 / Cornerstone Cheese & Charcuterie to Open in Wayne. This Summer, chef Christine Doherty Kondra is planning on opening a new artisan cheese and charcuterie shop in “Downtown” Wayne (quotation marks my own addition) called, Cornerstone Cheese & Charcuterie. 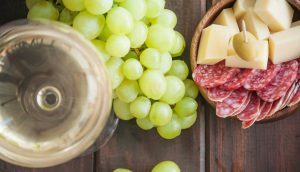 Cheese and cured meats happen to land high on our list of things we love, so we like the sound of a new cheese and charcuterie spot opening up on the Main Line. 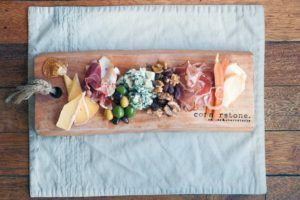 When we heard that chef Christine Doherty Kondra was behind the aptly named Cornerstone Cheese & Charcuterie set to open in Wayne this summer, we felt it was our civic duty to alert our audience. ans of all things cheese and meat will have a new destination this summer. 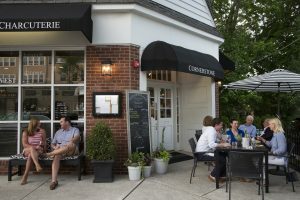 Chef Christine Doherty Kondra has announced plans to open Cornerstone Cheese & Charcuterie at 1 West Avenue in the heart of Wayne’s business district. Chefs Christine (Doherty) Kondra and Nick Kondra have set up a 14-seat chef’s counter with a train view, which not only will accommodate daily drop-in customers (it’s BYOB) but will serve as seating for culinary classes held by visiting chefs. Apparently, there are places like this all over Europe, Northern California and hip downtowns across the country, but I can’t think of a spot quite like it on the Main Line. 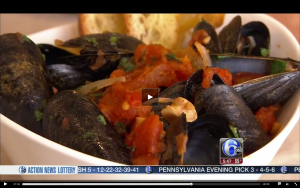 The concept – a gourmet shop/BYOB/chef’s table hybrid – taps into the tapas trend and then some. “We do this because we love, love, love it,” said Doherty Kondra, noting that 18-hour days are not unusual in the restaurant business. The couple and their boxer divide their time between apartments in Society Hill and Wayne. call us at 610.688.1888 or email us below. 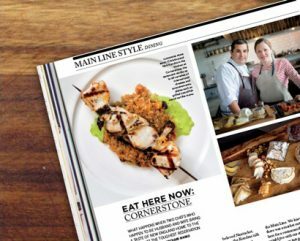 Husband and Wife duo, Christine and Nick Kondra, are bringing their own unique approach to dining at Cornerstone Cheese and Charcuterie. 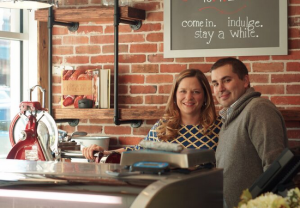 Christine and Nick Kondra are Owner/Chef of Conerstone Cheese and Charcuterie. 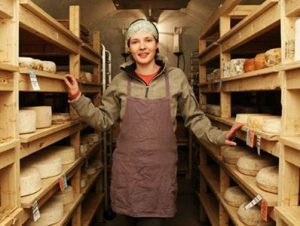 “We have cheese, we have charcuterie that we sell, and we also have a 14 seat BYO,” said Christine. 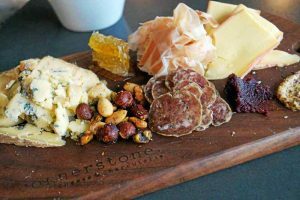 Chefs Christine and Nick Kondra’s Cornerstone Cheese & Charcuterie has been buzzing since its debut in downtown Wayne (1 West Ave.) in early fall 2015. 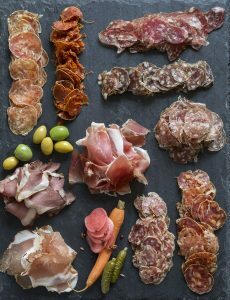 As the name implies, you’ll find an extensive arsenal of grab-and-go meats, cheeses, pickles and breads, as well as house-made pâtés and sausages. 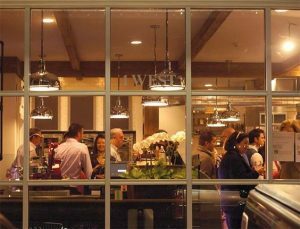 With only 14 seats at their chef’s counter and a busy, regular dinner service—reservations are highly recommended. Space is BYOB; weekend brunch and lunch also available. What happens when two chefs who happen to be husband and wife brings taste of New England home to the Main Line? The toughest reservations Wayne. History: Founded by Skip & Bill Bennett, Christian Horne, Don Merry. About: The farm is at the heart of everything Island Creek does. A muddy, windswept at in Duxbury Bay, MA is where it all started and where it will always remain. Growing from the back of a pickup truck to one of the largest oyster companies in the United States, Island Creek Oysters can be found on menus such as The French Laundry, Per Se, Next, and even the White House. Fun Fact: The “ring” depicted in Island Creek’s logo depicts a tool which harvesters use to measure oysters for the optimal 3” length. Our good friend Tim Bodell will be visiting us once again for an intimate visit in our very own kitchen. After giving us an exlcusive, behind-the-scenes view of his stomping grounds at the Francis Ford Coppolla Winery’s full-service restaurant – RUSTIC, Francis’ Favorites – he’ll be bringing his special touch to the east coast for a limited engagement. We’re finalizing our chef series schedule for early fall, stay tuned for dates. 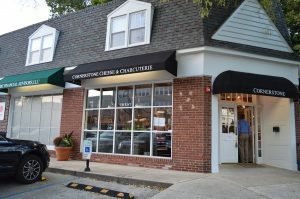 The brainchild of Christine and Nick Kondra, Cornerstone Cheese & Chatcuterie opens today (Friday, October 9) in Wayne, offering an array of expertly crafted meats and cheeses, prepared foods, a daily menu and cooking demos from visiting chefs being brought in from all over the country. Cornerstone Cheese & Charcuterie, a BYOB in Wayne known for its open kitchen and visiting chef series, is launching a raw bar happy hour. It will run from Tuesday to Saturday from 3:30–5:30 p.m. and on Sundays from 1–4 p.m. (Note: Cornerstone is not open on Mondays.) The oyster bar went live last Saturday, January 30. All along and criss-crossing Lancaster Avenue in Wayne, there are interesting, even eclectic, offerings when surveying the landscape for a dining destination. Margaret Kuo works culinary magic with the brightest flavors culled from the Asian pantry. The Great American Pub is full of raucousness and mojo replete with equally matched fun food that takes the edge off of a long day (or week). White Dog Cafe is warm, casual and gentle for the taking. The drive to share food, to share the comfort of the table is made greater with the bond, the partnership, the sweet embrace of a communal table. Gather many or few, awaken the senses with artfully crafted and presented quality food and the remedy is oh-so-right. Christine Kondra’s artisan market and BYOB both offer the best from around the country—New York smoked salmon, cured meats from Chicago—serving it simply. Guest chefs from across the globe visit for one-night-only multicourse dinners. Weekend brunch is our favorite—especially the grilled shrimp and Castle Valley grits. I take a great deal of pride in my homemade hamburgers. Some—my saintly wife to name names, but don’t tell her I ratted her out—might even say I’m obsessed with them. From the meat selection (ground chuck, 80/20 lean-to-fat ratio) to the bun (Martin’s potato all the way) to the toppings (Heinz ketchup on one side, Duke’s mayonnaise on the other), not a single detail goes unnoticed. 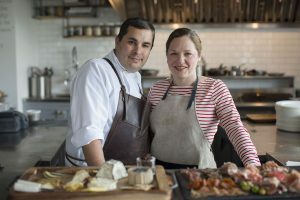 Cornerstone Cheese & Charcuterie Chefs/Owners Christine and Nick Kondra are excited to welcome Executive Chef Francisco Millan of Boston’s renowned Row 34 for an exclusive two-night cooking series. 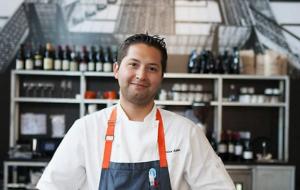 At Row 34, Chef Millan’s specialties include the delicate art of smoking and curing fish along with his outstanding ceviche and crudo program. 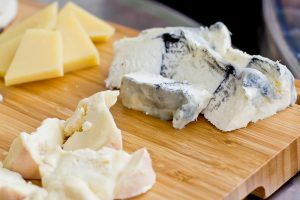 Everyone loves cheese, and you can never really disappoint anybody by putting out a nice cheese board,” suggested Michael Montesano of Montesano Bros. Italian Market & Catering in Eagle and Bucktown. This Philadelphia native grew up in the restaurant industry, learning the ropes from her father at the Downtown Club. 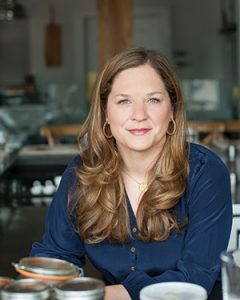 After acquiring her chops as a bartender and learning to wear many other hats on the team, she moved on to help launch Union Gourmet and later acquired her merchandising skills at Rittenhouse Square’s Anthropologie as well as orchestrating sales and planning at Brûlée Catering. Alyssa is a true team player and embodies the passion for quality and hospitality that we strive for. Christine grew up just a few miles away from Cornerstone, in Berwyn, PA. Working in restaurants from a young age, she developed a love for food and learned to use it to craft memorable experiences. Eventually, she embarked on a successful career in the bio-pharmaceuticals industry which carried her to New York, Boston and London – but before long she was beckoned back to her true passions… Following her instincts, she arrived at the Nantucket Wine Festival and immediately dropped anchor. 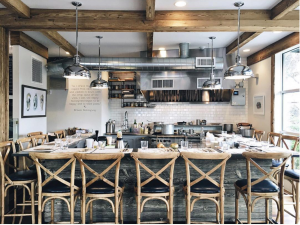 Nick left Bistro 5 to start working on Nantucket Island at Straight Wharf Restaurant. This is where he met Christine and it was love ever since. Nick working at SWR, and Christine being a private chef. 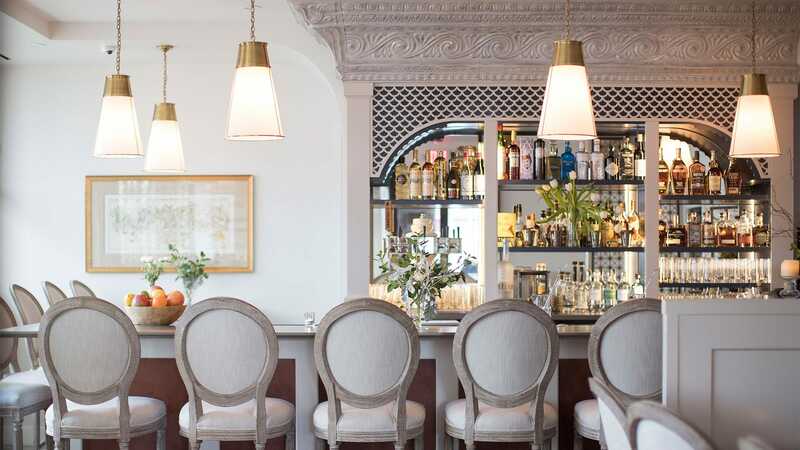 They would spend the winters up in New England with Nick working at Ten Tables Cambridge, back for Chef Vittorio at his new Restaurant A Tavola, and Ceia in Newburyport, MA. Then they would spend the summers on Nantucket working. With the desire to be closer to family, Nick and Christine moved to Philadelphia and Nick immediately started working for Marc Vetri and Brad Spence at Amis. After a few quick months, Nick became the Pasta Chef and stayed for almost a year. He left to become the opening Sous Chef at Brick and Mortar eventually leaving to open up Cornerstone with Christine. Bien Cuit is committed to sourcing practices that support regenerative agriculture and the farmers practicing it. Using flour from small, regional mills and farmers whenever possible, they are working to build the networks and distribution channels that make access to local agriculture possible. Bien Cuit’s method of small batch mixing ensures our bakers have the ability to give each loaf the same level of attention that a baker would have hundreds of years ago when mixing was done entirely by hand. We pair this technique with slow fermentation, which requires 16 to 68 hours for each loaf. More control over gluten and fermentation ensures we can balance acidity and maximize the taste and texture of every loaf. The husband-and-wife owners of Wayne’s Cornerstone Cheese & Charcuterie share their Society Hill kitchen, a modest space that packs a surprising punch. Not unlike their surging shop. 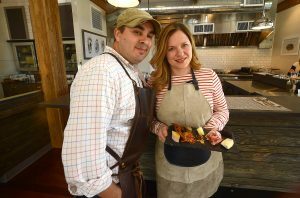 Christine and Nick Kondra, chefs and owners of Cornerstone Cheese & Charcuterie, will host a cooking class on March 22 focused on two ways to cook lamb. Learn to cook a grilled rack of lamb with spring seasonings and a lamb loin stuffed with spinach and pear. The lesson will also include how to prepare vegetable sides for the entrees. 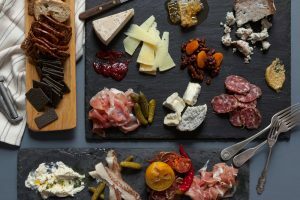 Chefs Christine and Nick Kondra serve an intriguing menu of expertly curated artisanal cheeses, smoked and cured meats, accoutrements, and house-made sausages and pâtés. Cornerstone is a BYOB, so bring along a bottle of wine or craft beer—the Kondras are happy to make suggestions for the best pairing options. Best of 2016 / Cornerstone Cheese & Charcuterie to Open in Wayne. 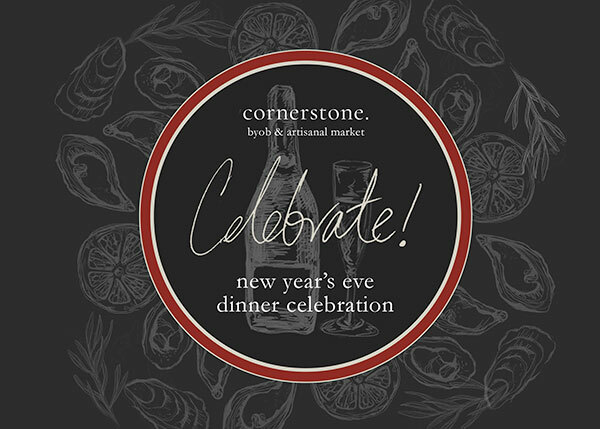 After Wayne’s 2012 dining explosion, new additions are now curated—like the careful selections at Cornerstone, opened in October as the passion project of Christine and Nick Kondra. A new foodie clubhouse has opened in Wayne. 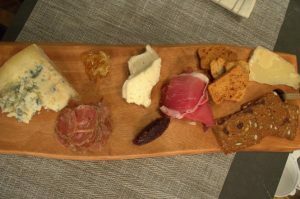 Cornerstone Cheese & Charcuterie offers an impressive variety of its titular treats—plus a whole lot more. The space also operates as a micro-BYOB (just 14 seats), a coffee shop and a culinary classroom. 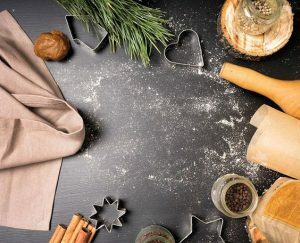 For ladies who love baking, Cornerstone’s upcoming event is a must-attend. Spend the afternoon sipping on champagne, deocrating cookies and munching on charcuterie. The event takes place on Sunday, Dec. 13, from 2–4 p.m. at the Wayne cheese and charcuterie shop. 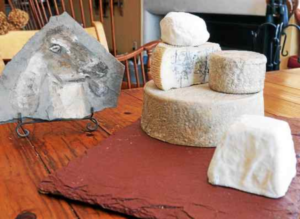 Local cheese aficionados eager to learn more about the industry have the opportunity to mingle with Vermont’s acclaimed cheesemaker, Jasper Hill. Taking over the counters at Wayne’s new Cornerstone Cheese & Charcuterie, it will hold an intimate class and multi-course tasting on Tuesday, Nov. 17, from 7–9 p.m.
Matzo doesn’t have to be dry and boring. 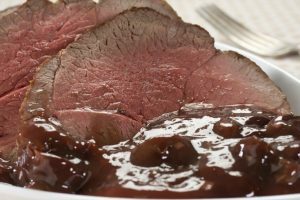 Here, Philadelphia experts incorporate the popular Passover food in recipes for creative twists on matzo ball soup as well as a few other dishes. 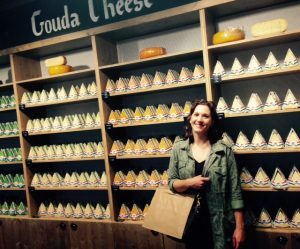 Cornerstone Cheese & Charcuterie is a homecoming of sorts for Berwyn native Christine Doherty. Along with her husband, Nick Kondra, Doherty brings a European-influenced eating experience to downtown Wayne. Disenchanted with a perfectly fine corporate gig, Kenley first plotted his escape into the culinary world by volunteering himself to the kitchen at Majolica in Phoenixville, PA. Immediately encountering intriguing yet unfamiliar terms like pavé, mignonette and creme en anglais, he promptly rushed to Barnes & Noble to acquire literature on the subject of French cuisine and more. Inspired by these new discoveries, his nose-to-tail-tasting-menu cooking mentality began to take shape. Continuing the journey to Blue Pear in West Chester, Garces Group in Philadelphia, Tired Hands in Ardmore and beyond – his respect for raw quality and hyper-seasonal focus on freshness developed. Eventually finding himself at Cornerstone, he returns to his roots amongst like-minded company. 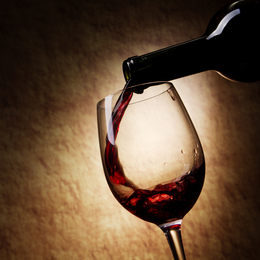 A Social Capital interview with the co-owners of a small Wayne BYOB. October 2015 / Contributing editor Tara Behan reflects on the places she’s encountered some female trailblazers. American Cheese Month kicked off on October 1, and Cornerstone Cheese & Charcuterie is celebrating in scrumptious style with the addition of its new Taste box. Each Taste box is a seasonal curation of the finest artisanal products, thoughtfully hand-selected by Cornerstone’s chefs and mongers. Every month, Cornerstone will offer a memorable and unique combination of flavors and hard-to-find treasures. Each box will contain 6 oz. of charcuterie, 8 oz. of small batch artisanal cheese(s), a seasonal compote and/or accoutrements and one seasonal item (food or non-food item) to be determined. About: Benton’s Smoky Mountain Country Hams are slow cured using salt, brown sugar, and sodium nitrite and typically aged 9-10 months, though hams are available 1 year and older. This time-honored practice dates back to the era of our forefathers, when the preparation and preservation of meat was a way of life and sustenance. History: Joel Russ opened his first shop in 1914 on Orchard Street below East Houston. About: A New York staple for over 100 years, Russ & Daughters has been working with smokehouses for generations to provide its customers the highest quality salmon they can. 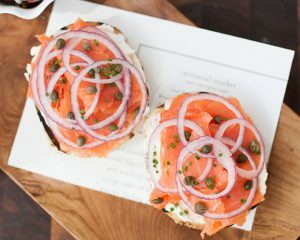 While the terms “lox” and “smoked salmon” are often used interchangeably, at Russ & Daughters the original definitions still hold. “Lox” refers to belly lox from salmon that’s been brined and salt-cured, never smoked. Fun Fact: Russ & Daughters’ smoked salmon was served at the inaugural party for President Ronald Reagan. N’duja: A spicy spreadable Calabrian style salami is composed of no less than 1/3 of its weight in Fresh imported Calabrian chili peppers and Chianti red wine. 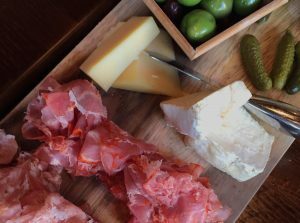 History: West Loop Salumi opened in 2013 as Illinois’ first USDA salumeria. About: Salumiere Greg Laketek trained in Italy under the famous Massimo Spigaroli only to keep to his Italian roots and the salumi traditions. West Loop pork comes from Slagel Family Farms Midwest 100% Berkshire hogs, unless noted otherwise. Everything is fermented and dried slowly and according to the European traditions. All casings are natural, each product is hand tied with natural hemp twine. All Salumi are seasoned using Sicilian sea salts and the highest quality ingredients available. 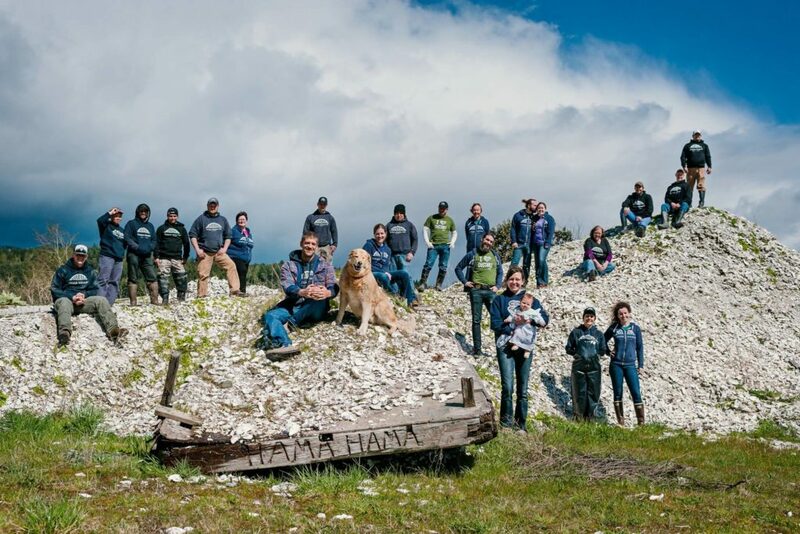 History: Hama Hama is a family-owned and operated sustainable tree and shellfish farm operating on land along the Hood Canal on Washington’s Olympic Peninsula purchased by Daniel Miller Robbins in the 1890s. About: Hama Hama is a fifth generation family-run shellfish farm. Their beds are located at the mouth of one of the shortest, coldest, and least developed rivers in Washington State, and that purity is reflected in the clean, crisp flavor of the oysters downstream. Hama Hamas are famed for their size, shell strength, firmness, cucumber flavor, and light finish. When you see a Hama Hama, you know it is a well-weathered oyster. The knobby, heavy, sand-green shells speak to life on the beach—not just for a few months, but from infancy. Let us know what you’d like and when you need it by. We’ll contact you to confirm your order. History: Little Islands are named for the small island located just off the farm site of Frank and Tonyia Peasley, where they hand-raise these oysters in floating mesh bags right next to their family camp. About: Little Island is located on the Bagaduce River in Maine. These hard-to-find gems are raised in suspended culture near the river’s reversing falls. The strong tidal action constantly jostles the oysters and causes them to “cup up,” and the exposure to the sun keeps their shells white. They have a medium-low salinity, crisp and mild finishing with a pinch of sugar, like biting into a sweet white fish. Fun fact: The farm occupies just over 5 acres along a rocky shoreline of the Bagaduce River. There is only one other farm in the river! About: Bitto is the rarest cheese made in Italy today. The herd is brought up to the “high field” (at 1600 meters above sea level) in the mountains of Lombardy to graze on the alpine pastures during the warm summer months of June to September. 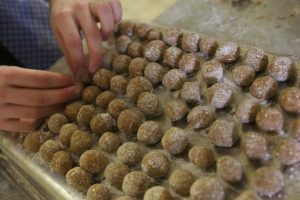 The farmers work in small batches and produce only 4 wheels of Bitto a day over a wood fire in an “alpeggio” style. This rare and beautiful cheese can age up to 10+ years. The slight tang and tartness from the cheese is caused by the elevation change! July 20, 2017 / Best Brunch, ‘Burbs. 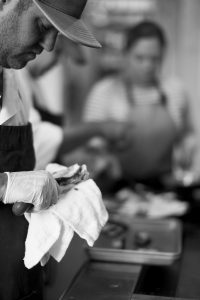 Grab a seat at the open kitchen counter and watch as the best bacon in the country (Benton’s) and the best smoked salmon in the land (Russ & Daughter’s) are turned into something magical by chefs who know what they’re doing. Consider starting with a cheese plate, because when do you get to do that for brunch? Stay up to date on the latest events and announcements from Cornerstone! August 3, 2016 Nick & Christine Kondra Opening Cornerstone & What It’s Like Working Together. What happens when two chefs who happen to be husband and wife bring a taste of New England home to the Main Line? The toughest reservation in Wayne. March 15, 2017 / Cornerstone BYOB. Wayne’s quaint Cornerstone BYOB has put together pairings of their finest artisanal products hand-selected by their culinary team. March 15, 2017 / Road Trip: The Main Line in a Day. 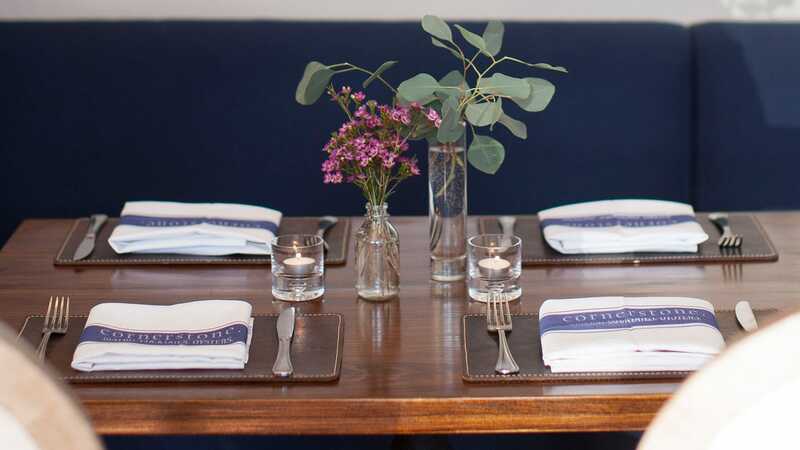 …Cornerstone offers a quiet setting for an elegant lunch (or dinner). The menu features salads and sandwiches, but I recommend trying its carefully curated cheese and charcuterie boards. 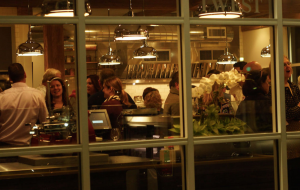 Sit by the counter and listen to the staff share the stories behind your food. 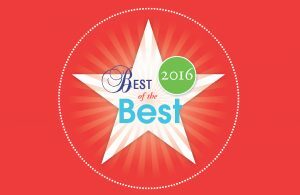 May 11, 2017 / Mother’s Day Dining Guide Around the Main Line 2017. Show your love with taste this Mother’s Day–especially if Mom is a gourmand! Wayne’s quaint Cornerstone BYOB has put together pairings of their finest artisanal products hand-selected by their culinary team. 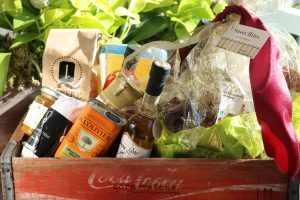 Cornerstone gift packages/baskets can be custom designed to include select cheeses and charcuterie, any of their artisanal accoutrements and a bottle of wine of your choice. Include a gift certificate to Cornerstone for Mom and you will surely wow her taste buds! Originally from Long Island, Steven Gullo grew up with an interest in cooking and hospitality at a young age. 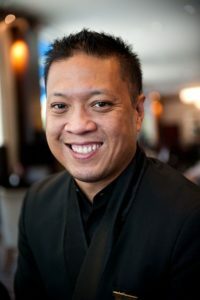 That passion brought him to the Culinary Institute of America in Hyde Park, NY where he received a Bachelor’s degree in Culinary Arts Management. During his training he developed a fondness for wine and beverage. A crucial moment occurred in school when he tasted a glass of 1966 Chateau Lafite-Rothschild. Since then he hasn’t looked back! 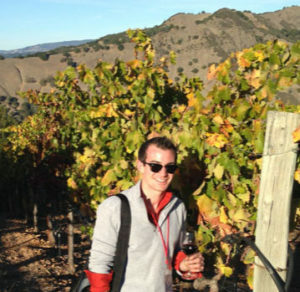 Earning the top score in both his Introductory and Certified Sommelier exams, Steven most recently passed his Advanced level exam with the Court of Master Sommeliers and placed 3rd in the national finals for Best Young Sommelier 2016 held in Sonoma. Steven’s experience has led him to travel numerous wine regions including South America and all along the west coast. 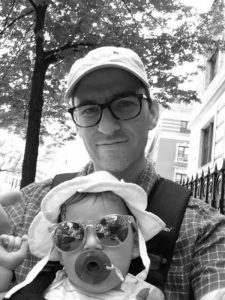 Aside from his work at Cornerstone, Steven spends free time with his wife and family in PA and New Jersey. Sharing a Syracuse connection with Nick, Scott spent his college years there attaining a degree in computer engineering, but later ventured into the public safety arena as a firefighter and EMT in North Syracuse and then the Town of Cary, NC. 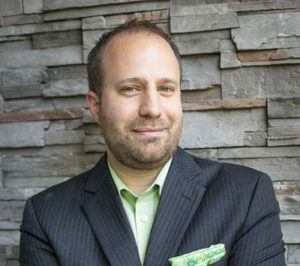 Subsequently beginning his journey into the culinary and wine world by managing across a number of restaurants and country clubs, he eventually attained formal training through the Court of Master Sommeliers, Society of Wine Educators, and the Cicerone Certification Program. Pouring his experience from the hospitality industry and passion for wine into the development of an award winning wine program for Cornerstone, Scott is also a strong advocate for Pennsylvania wine and often consults with the Pennsylvania Wine Authority as well as many local winemakers. 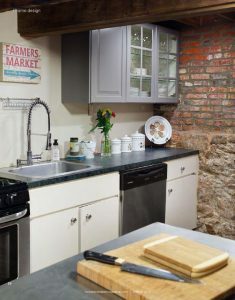 Growing up in an Italian family, Owen spent considerable time in the kitchen learning family recipes and to appreciate quality food made with love. After graduating from Penn State with a degree in Public Relations, Owen moved to San Diego, California with a few college friends to “live the dream.” During his time in San Diego, Owen truly learned the value of food and the works it takes to put food on the table by working on a 140-acre organic farm. From his experience at the farm, Owen joined the Urban Kitchen Group as Marketing + Social Media Manager. In this role, he was responsible for overseeing all aspects of marketing, events and social media for a collective of five Italian kitchens + wine shops, a catering company and on-line shop. After 16 years in San Diego and one engagement later, Owen has moved back to the Main Line. He’s excited to work alongside Christine, Nick and the entire Cornerstone team. Complete the form below to join the guest list for this exclusive event. 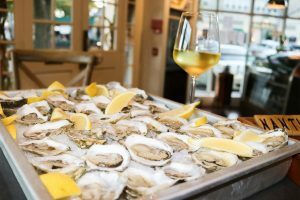 History: With more than 20 years in the oyster business, Raspberry Point Oyster Co. raises cocktail, small, and large choice oysters in the picturesque cool, clear waters off Prince Edward Island, Canada. 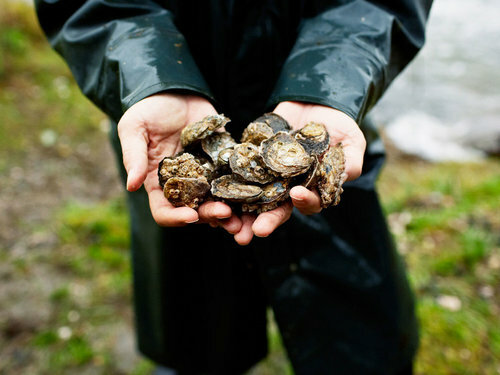 About: Raspberry Point’s leases are some of the most northern stocks of oysters on North America. Because of this, each oyster takes between 4 – 6 years to reach market size. Tasting Notes: 3 to 3½ inches in size, they have a wonderful salty taste, clean flavour with a delightful sweet finish. About: The Aunt Dotty’s are the newest member to the Island Creek portfolio. They are grown about a mile from the Island Creeks right off of Saquish Beach (technically a part of the town of Plymouth) on the tidal lands next to Skip’s cottage. The cottage has been in the family since the days of the pilgrims, and he actually has a deed that proves that he owns the tidal area (only an oyster farmer would really care about this!). Anyway, the Aunt Dotty’s are also grown in trays, but are much more exposed at low tide, and for a longer period of time. They are named after Skip’s great aunt Dotty who was the last relative to live in the cottage year round. 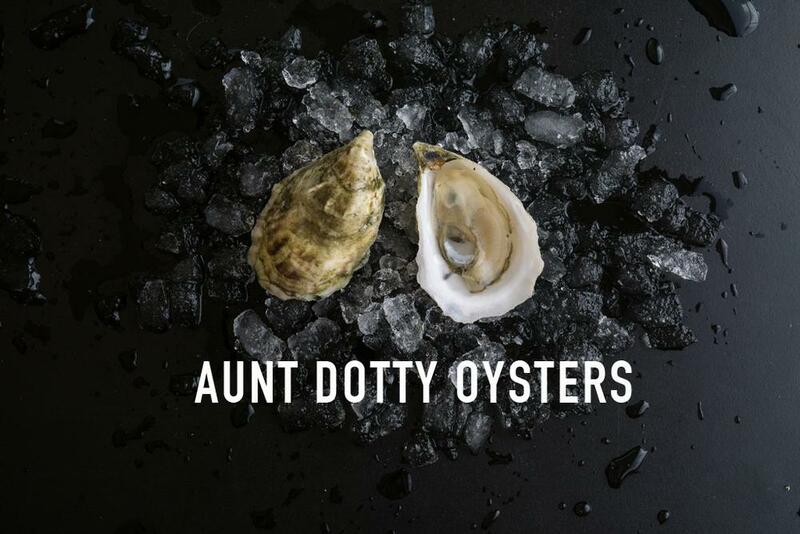 Tasting Notes: The Aunt Dotty’s are the most savory of the bunch. While still salty, they have a complex acidity and fullness to them. They have the most intense flavor of the lot and we love them. Aunt Dotty oysters are the most petite oysters that we carry. 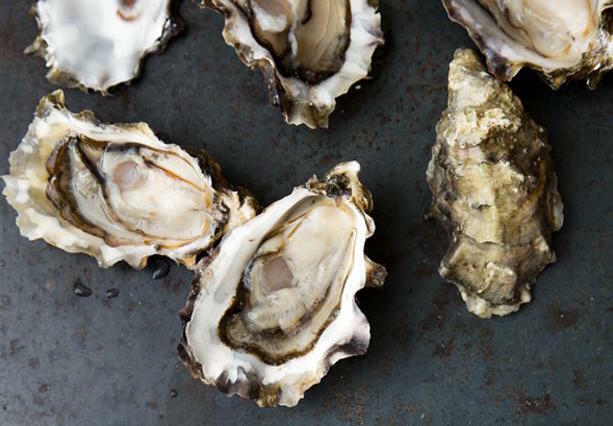 About: Grown by Hama Hama at their summertime oyster farm, located on the northern end of the Olympic Peninsula in the Straits of Juan de Fuca, where the water stays cool all summer. Summerstones are beautifully cupped with a delicate frill at the edge, evidence of their bag-to-beach grow out method. These are ocean oysters, fed on cold water recently upwelled from deep in the Pacific. Fun Fact:These are a very seasonal oyster, only available in the summertime. Tasting Notes: Expect them to be sweet on the finish but bracingly briny up front. About: Blue Pools are tumbled oysters grown at Hama Hama. Tumbling gives these oysters deep cups and smoother shells for easier shucking and better presentation. It also changes their flavor and seasonality. Raw Blue Pool oysters tend to have more body than beach grown varieties. About: The Disco Hama is grown in Discovery Bay, just off the Strait of Juan de Fuca. All summer long the North wind blows down the strait, causing nearshore upwelling that brings cold, nutrient rich water to the surface. Disco Hamas are grown in bags on top of cobbled beaches, giving them a nice deep cup with a bit of frill, on a point on the western side of the bay. The farm site has swift currents, for ample food, and heavy southwest winds, for shell conditioning. Tasting Notes: These are salt-forward oysters, mellowing to a crisp sweetness with a finish of fresh spinach, green olive, and light smoke. Isaac started working in fine dining and brew pubs in Portland, Maine. After seven years of serving, bartending, and wine buying, his fondness for the world of wine led him to New York City in 2005. There, he worked at the Morrell Wine Xchange on the Upper East Side, then as a manager at Gotham Wine and Liquors, and finally managing at 67 Wine & Spirits. He has presented many times on wine regions, styles, and spirits. He was overjoyed to find in Nick and Christine Kondra, kindred spirits in providing world class food and drink in the context of world class hospitality. His enthusiasm for wine, spirits, beer, and saké keep him engaged and excited about Cornerstone’s exceptionally cultivated and curious guests. About: Established in 1878, the Olympia Oyster Company began when commercial fishing and lumber businesses were in their infancy. The “Oympia Oyster”, the oysters native to the West Coast, spanned from Baja, Mexico to southeastern Alaska. At the center? Washington State. 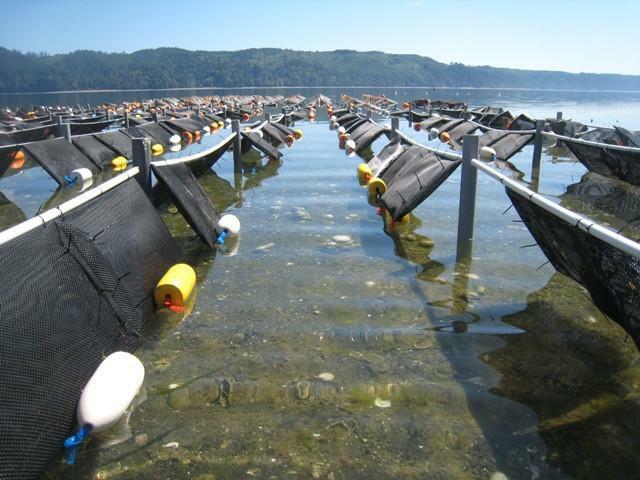 Fearful of overharvesting, which wiped out San Francisco’s stock, the Puget Sound harvesters invented a crop management system to ensure a sustainable supply of oysters. Dike construction, as it was referred to, covered the seabed with a series of man-made terraces, filling and leveling the tidelands with shell and gravel, retaining two or three inches of seawater at low tide. This buffer provided natural insulation, protecting the crop from extreme temperature variations. Tasting Notes:Less than a third the size of a Pacific oyster, Olys are delicate in size (about the size of a Fifty Cent piece) but bold flavor, most commonly described as plumper, firmer and sweeter than all the rest. 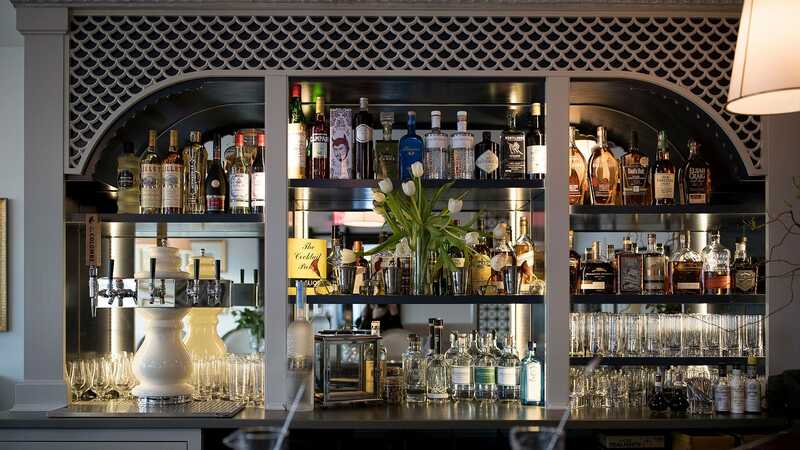 Prior to Cornerstone, Marc was Head Bartender at the Merion Cricket Club in Haverford, PA; Bar Manager of Dan Dan’s flagship restaurant in Rittenhouse Square, Bar Manager of Han Dynasty of University City and Old City; and the Master Mixologist of Sofitel Philadelphia. Though Philadelphia born and bred, Marc began his mixology career in Chicago. Originally recognized as one of the “Up-and-Coming Mixologists” by Time Out Chicago Magazine, one of his cocktail creations was named the “Best Cocktail in Chicago”. Returning to Philly in 2010 with his family, Marc wasted no time and entered area bartending competitions, attaining accolades such as finalist for “Bacardi Rum’s Pina Colada National Competition” at the annual Tales of the Cocktail in New Orleans; and at the annual “Philadelphia Whiskeyfest” event, he was bestowed the title of “Woodford Reserve’s Master of the Manhattan”. 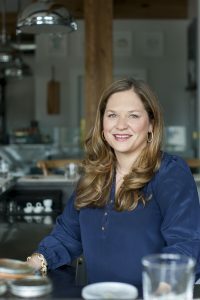 Raised in Reading, PA, Sarah attended Penn State University before making the move to Washington D.C. to work her way through the city’s restaurant ranks. Her first management position was with Neighborhood Restaurant Group. This was followed by an exciting role as the Events Coordinator and HR Director position at Proof, Estadio & Doi Moi, and finally being an integral part of the opening team of restaurant Chloe by Haidar Karoum. After spending almost a decade in the DC restaurant scene, Sarah relocated back to her roots in the Philadelphia suburbs. 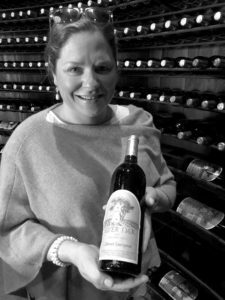 There was an immediate connection at her first meeting with Christine where it was clear the two shared a serious passion for food, wine, and genuine hospitality. With Sarah’s 10+ years of restaurant management experience, she looks to bring fresh enthusiasm and ideas to the already successful Cornerstone family. This April, in honor of National Autism Awareness Month, Cornerstone is looking to help bolster a great local cause by donating to the Eagles Autism Challenge. 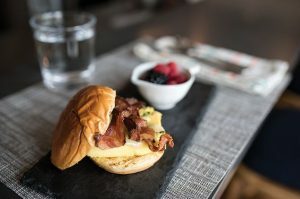 Dine at Cornerstone for lunch Tuesdays through Fridays in April and 10% of your check will help support innovative research and programs to help unlock the mystery of autism.